I have been thinking about my personal learning environment and how it looks. I was doing some baking the other night, which in itself is a very rare event, making walnut and chocolate chip cookies. But as you see by the photo above, they did not stay in the separate blobs I put them in but rather, all merged into each other when they were baking. Looking at them reminded me of my PLE - lots of individual online tools and activities that all merge into one PLE. How do others see their PLE? When I first started thinking about making some sort of diagrammatic representation of my PLE, I had a look at how others saw their PLN. Stephen Downes depicts his PLE as something like a river - inputs flowing into content editor and from there into outputs such as MySpace, Blogger and Flickr. Martin Weller sees his PLE as more of a sunflower - his learning environment is at the center of the flower with tools and activities branching out as petals. David Delgado's PLE looks similar to that of Martin Weller but there is more two-way interaction between the tools, activities and the hub of David's PLE. David identifies Elgg, which is a social networking platform, as the centre of his PLE. 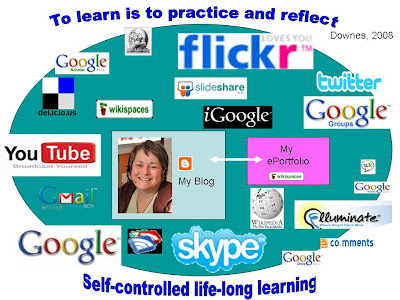 The hub of my PLN is this blog, alongside my ePortfolio. I chart my activities, learning and reflections in this blog and then gather them up in my ePortfolio for display. Ultimately, my blog is the most important aspect of my PLN, which is why I have made it bigger than my ePortfolio in the diagram below. In the diagram you will see all the tools I use for gathering and processing information, communicating and collaborating, learning, reflecting and publishing. All these tools and activities are so inter-related I thought it was more meaningful to encapsulate everything within my PLE, rather than have my PLE at the centre with arrows spreading outwards. The size of the icons indicates how important the tool/activity is to my learning. How do you feel about this diagrammatic depiction of a PLE? Does it make sense to you? How does your PLE differ from this? Hi Sarah, I like how you've diagrammed your PLE. It would be interesting to do it again in 6 months or a year to see how it has changed--what would be dropped, what would be new, and which ones will have shrunk or grown? You're right, Claire. I must admit I meant to say in my post that it is an evolving thing and maybe in a few months, it won't even be circular. Who knows... At the moment it seems to change even on a daily basis. Hi Sarah, Athena here. Thank you for sending your email with all those links. I really like the visual representation of your PLE. Be the niave inquirer that I am, I tried to click on the icons hoping for hyperlinks to the web-sites!! I will have to start looking at my own PLE and like to follow in your example with a diagram. If you look in my del.icio.us links, found at the bottom of the blog page on the right, you will find all the web sites I have tagged under 'ple' and 'PLE' and there you will find lots of different ideas about diagramatic representations of PLEs. Just realised - I haven't got Second Life there. Hi Sarah, I like very much your diagrammatic representation of your PLE. 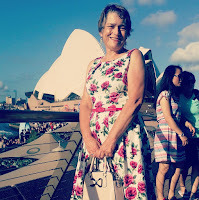 My PLE has centred around a range of Web2 tools for communicating and collaborating online for a number of years now and my PLE is continually changing as my needs do, but I realise after reading your blog that my PLE is lacking a social networking hub. It's funny that you've left a comment here because I was thinking about this post at the weekend and written a post about how my PLE looks 2 years later (will be published later this week so keep an eye open). My PLE would look very different if I didn't incorporate social networking. How would you depict your PLE in a visual way? Capetown Declaration - Captions please! What has web 2.0 got to do with catching babies?